Tapestry firescreens add a beautiful touch to your home and your fireplace. Over 200 designs are available. Any "unfinished panel" can be custom made into a firescreen. Unfinished panels can be viewed under the "cushions" category on this website, or contact us for designs. Different firescreen frames are available. Contact us at Classic Tapestries for more information. Tapestry firescreens add a beautiful touch to your home and your fireplace. 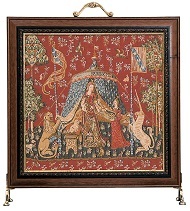 This design is woven circa 1490 for a noble family and the original hangs on the Cluny Museum in Paris today. Over 200 designs are available. Any "unfinished panel" can be custom made into a firescreen. Different firescreen frames are available. Contact us at Classic Tapestries for more information.